If you’re moving a container within New Zealand, then you don’t need Certification, but every container you buy or hire for international shipping, by truck, rail or sea, or any combination thereof, has to comply with the following international regulations for safety and transportation. The ‘International Convention for Safe Containers’. 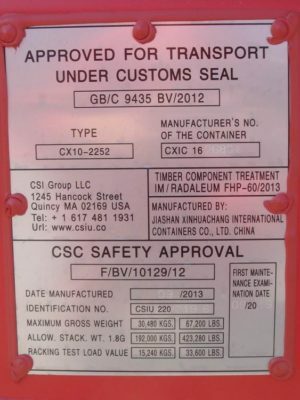 CSC is an abbreviation for the International Convention for Safe Containers. The Convention incorporates a series of design requirements (e.g., very precise dimensions at each corner of the container so that equipment that lifts and moves containers can always find the holes in each corner casting), minimum functionality and weather tightness plus various measurements of capacity, weight and resistance to the amazing forces that containers receive while underway at sea on ships or on land with trains and trucks. The purpose of the Convention is to insure that containers are safe and consistently built. The ‘Customs Convention on the International Transport of Goods under the cover of T.I.R. Carnets’ or ‘The Customs Convention on Containers’. All exposed wooden components used in the container aretreated with and comply with the requirements of ‘Cargo Containers -Quarantine Aspects and Procedures of the Commonwealth Department of Health, Australia’.